Pink and White Block Patterned Sweater. When it comes to either block patterned tops or sweaters, I have to add them to the MTYA collection. This sweater’s bold blocked pattern and colors, creates the perfect Valentine’s Day appeal. This sweater doesn’t just have to be worn for the special occasion, but can be paired all year around with either a top underneath or by itself. For styling, I decided to pair a blush fur for color coordination, but for additional styling methods, consider pairing a crisp white blouse underneath. I believe in wearing shorts all year around and during the Fall and Winter seasons, I gravitate to corduroy shorts. When I found these bold red corduroy shorts, I knew I had to add them to the MTYA collection because of their rarity, bold color, and high waisted detail. 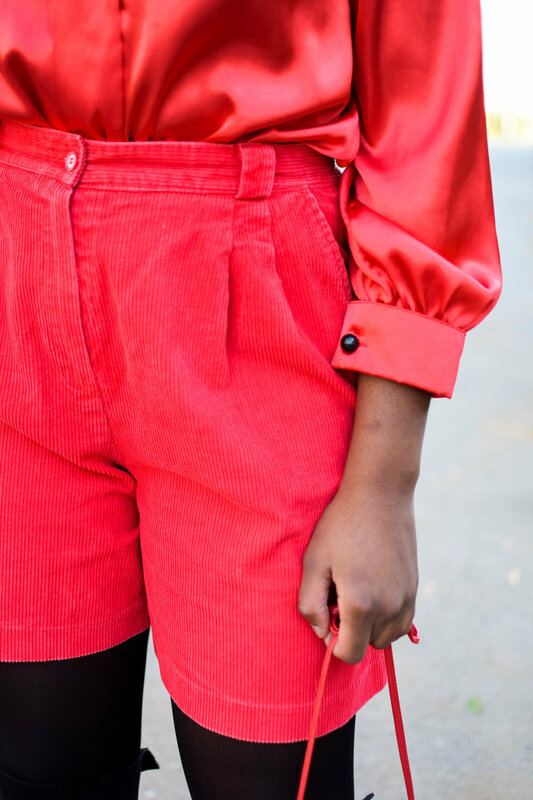 For this outfit, I decided to style these shorts with other bold red selections to create a monochromatic look. When considering other styling methods, think about pairing these shorts with a bold pink or yellow top. It’s always fun to experiment with colors combinations, especially when you have these shorts as a pairing option. The Red and White Checkered Jacket. 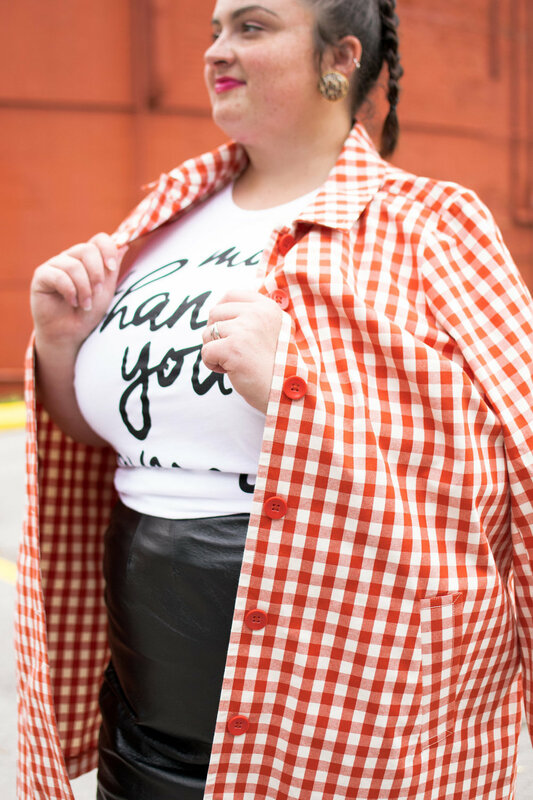 I’m here to tell you that checker is a fun pattern to style (as you can tell from the photo). I found this checkered jacket during one of my best and most memorable thrift adventures. I remember this jacket sitting behind a rack of neutral colored selections and the first thing that caught my eye is its collar. For this outfit, I decided to style a black leather skirt as a fun way of mixing textures. When thinking about other styling methods, consider pairing this jacket with solid pieces with a solid red, hot pink, emerald green, or mustard yellow dress. Additionally, consider the idea of a leather skirt or pant, but instead of pairing with a graphic t-shirt, consider a bold colored top. 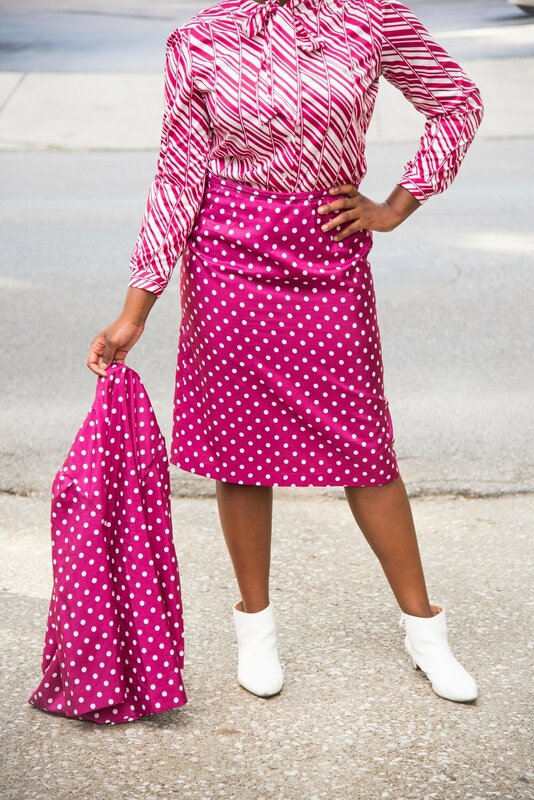 The Bold Magenta Polka Dot Two-Piece Set. Fun fact: Polka dots are one of my favorite patterns (aside from stripes). Just call me the polka dot lady! For this polka dot two-piece set , I really love this color with the mix of this pattern. On top of that, I love how this selection comes as a two-piece set. In styling, I decided to have fun with mixing both patterns into one outfit. For additional styling methods, consider pairing this two-piece set with a solid or another patterned selection. Did you enjoy this week’s MTYA favorites Valentine’s Edition? Remember to shop them directly for 20% OFF by clicking on the photos or the links in each description. Enter promocode: WEEKLYFAV to receive this week’s discount. SHOP THEM NOW!